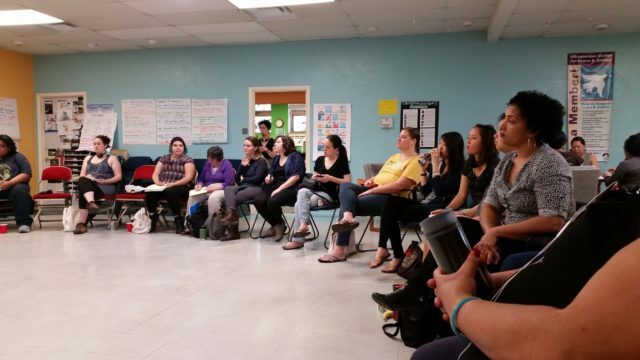 In May 2016, WE ACT for Environmental Justice sent Zelene Pineda Suchilt, our new Community Organizer and member Diane Lane-Hymans, to the Feminist Organizing School as part of the World March of Women-US (WMW-US) in Albuquerque, New Mexico. The event was hosted by the grassroots organization Southwest Organizing Project (SWOP) and Grassroots Global Justice Alliance. At a WE ACT monthly member meeting, I spoke with Zelene about the history of feminism in the U.S., and how patriarchy—a system of society in which men hold the power and women are largely excluded from it—directly affects oppression in the 21st century. Patriarchy, given all of our environmental challenges, negatively impacts the health and wellness of underserved, economically-challenged communities in New York City, America, and abroad. I wanted to share her experience with WE ACT members and supporters so we can all learn more about the connections between feminism and environmental justice. So, WE ACT members here is my brief interview with Zelene! REIKO: What does it mean to be a feminist today, according to your experience at the school? ZELENE: A feminist is someone who answers yes to the question: Are women human? Are people of color human? The answer is yes, of course! Unfortunately, our economic systems thrive on our our collective oppression and fear. At the retreat there were men, trans/gender non-conforming, and queer womyn who all agreed: everyone suffers under patriarchal structures. Men don’t get to explore aspects of their own humanity when their vulnerability and sensitivity is suppressed. We had an activity around gender called “Act like a lady, Take it like a man” about societal expectations based on gender. It was the most difficult module to digest because we internalize these expectations under the illusion that we somehow benefit from them, when in reality if we don’t transform these expectations, we hurt ourselves and others. REIKO: We had a brief conversation with respect to the “waves” of feminism from the late 19th century up to the present. Could you please expand on this topic for our readers? ZELENE: The Feminist Organizing School focused on how patriarchy facilitates colonialism, white supremacy, and capitalism. In addition, the school emphasized how feminism becomes imperative to the resistance and transformation of those systems. Our first day was devoted to participants’ impressions of the four “waves” of American feminism. The first wave emerged from the abolitionist movement and evolved to the suffragist movement. The second wave brought us well-known feminists such as Betty Friedan and Gloria Steinem, but women of color were mostly invisible until the third wave of the 1980’s and 1990’s. The third wave era is when Audre Lorde and Gloria Anzaldua contributed language and academic theories that were representative of women of color’. The current fourth wave centers on the most vulnerable women in the world, including queer and trans people, people of color, and of African descent. It does not discount our economic and spiritual connection to the earth itself. REIKO: Was there one topic or action that resonated with you that you would like to discuss, and why? ZELENE: Maria da Graça Samo is the international coordinator of the World March of Women, an international grassroots feminist movement that works to address the root causes of poverty and violence against women. She Skyped into our meeting from Mozambique and discussed the impact of the U.S. abroad. She shared with us that she had spent the early part of the day at the hospital with an academic comrade that had been shot in the leg in retaliation for his criticism of the government. It just really hit home how much of the work we do here in New York City we take for granted, without thinking of the international consequences. We have a responsibility to work locally with an international framework that protects human rights everywhere. WE ACT has made the commitment to becoming a bilingual organization and has actively supported the #Justice4Berta campaign, in honor of the slain environmental organizer who was murdered in her home in Honduras in March of this year, for her work against the construction of the Augua Zarca Dam on land that was sacred to the Lenca people. ZELENE: The capitalist and colonial economic systems have created climate change. Now, low income communities of color, women and children are taking the brunt of the impacts. We need to transform our healthcare, energy and food systems so that they don’t perpetuate illness on people, and the Earth. There needs to be a balance. Our Northern Manhattan Climate Action (NMCA) Plan aims to to create alternatives to how we organize, disseminate information, and heal as a community. We must create an economy that is autonomous from corporations and keeps the system accountable to ALL people. 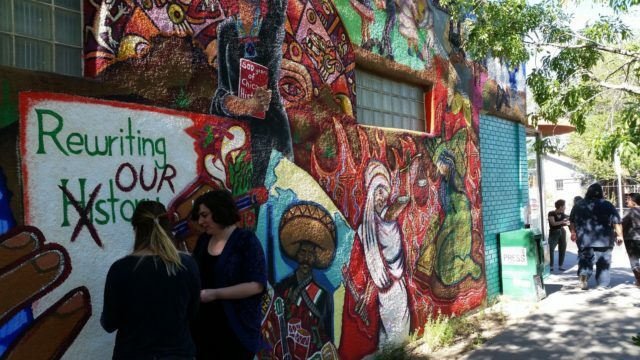 REIKO: How does what you learned in New Mexico connect to our work in Northern Manhattan? ZELENE: The school was a great resource personally and professionally, I look forward to sharing these tools from the Feminist Organizing School with the rest of the WE ACT to strengthen our groundwork, I believe this will help connect the dots between feminism and major challenges in Northern Manhattan with climate change, food justice, health, and disaster preparedness. Another thing to consider is that our membership is predominantly female, and there are many issues related to our bodies and the environment. Many members have expressed concern around domestic violence and toxins in beauty and sanitary products that negatively impact the Earth and our bodies. Notably, the City recently passed an initiative to provide free tampons and pads at public schools, prisons, and shelters, perhaps we can work towards them being toxin-free too. Reiko Bass (PHN, BSN, RN) is a public health nurse with the Department of Mental Health and Hygiene. She is a resident of Hamilton Heights and a WE ACT for Environmental Justice member.